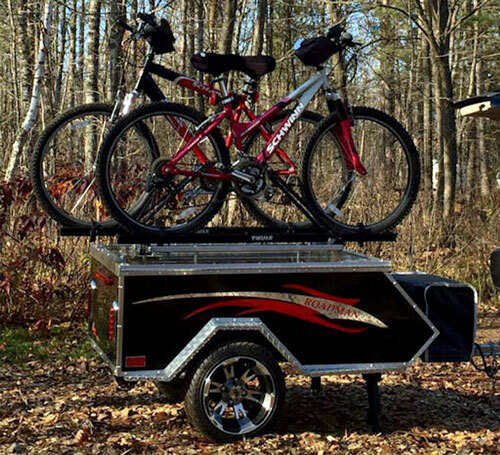 Roadman Camper is a lite, dual use motorcycle trailer with great cargo capacity, sleeping place for 2, dressing room and plenty of options…. The Roadman Campers is a small family business founded by Bryan and Juanita Nelson in 2005. After taking retirement from his regular business, Bryan (otherwise long time motorcycle rider) built his motorcycle camper and “hit the road”. Well, this experience combined with entrepreneurship mentality and “fix-it” approach convinced him to “cash” on his passion for motor-biking. The rest is the history named Roadman Campers. The company operating from Saginaw (Minnesota) makes lightweight motorcycle camper trailers (RC model) and cargo trailers (AS model). 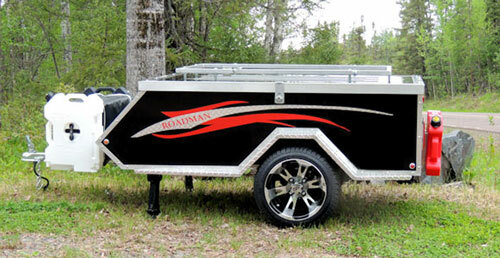 Roadman Camper trailer - here with optional tanks and Coleman cooler. It is designed to sleep two adult persons. 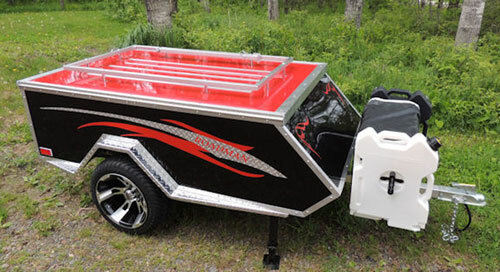 It is designed as a dual use trailer – in other words it can be used either as a camper or a cargo trailer. Ability to sleep two persons is an obvious advantage (although not that easy to find on the market of motorcycle campers). 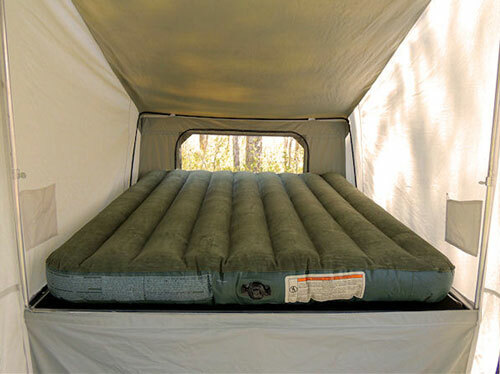 And even more – while the standard tent version is designed for full size bed (50” x 76”), the company also offers more comfortable one with queen-size bed platform (60”x76”). The extra bonus (rarely seen in this kind of camper trailers) is the tent’s vestibule. It makes an integral part of the tent space and frankly, it’s hard to overestimate its practicality. With dimensions of 50” (60” for Queen-size) x 42” x 88” (height) the vestibule serves as the “dressing room” with adequate privacy. The polyurethane floor with 6” band around provides full protection from water. Four large windows with adjustable zipped closures offer good ventilation, connection with nature but at the same time privacy (when needed). 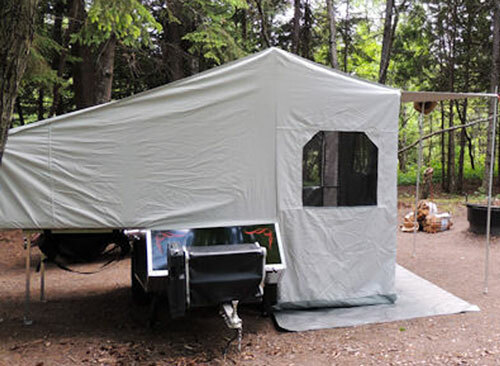 And one more level of security (or if you want of “peace of mind”) - the tent is made by Canvas Replacement (Loyal, Wisconsin) – one of the most respected manufacturers of canvas for pop-up campers. When on the road, the tent and corresponding hardware (pols, ropes, stakes) is stored in the trailer. It takes about 4 cubic feet out of available 19 cubic feet. However when you decide to use the camper just as the cargo trailer, the full storage is available form “stuff”. That is the beauty of the design – dual use, depending on your needs. But this kind of universality does not come for free. The negative impact is that the tent does not have an “auto-setup” feature. In other words, instead of just “touching the button” and watch the tent popping-up, you will rather have to “unbutton” your shirt, roll-up sleeves and set it up by yourself. The truth is that the auto-setup hardware takes storage space and adds extra weight decreasing space and cargo capacity available for your stuff in camper mode. It will also make the process of converting camper into cargo trailer more complicated (if not impossible). 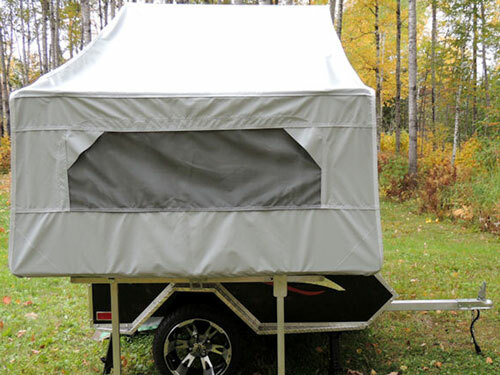 Large set of options makes the Roadman Camper trailer even more universal. The company offers set of 2-gallons tanks for water, fuel and tools. Thanks to distinctive colors (correspondingly white, red and black) their functionality never raises any doubt. They can be mounted either in front of the trailer or on its read end. Very practical addition is the Coleman cooler (w/cover). Similarly as the tanks, it does not take any storage space as it is mounted on the tongue. The top rack (standard feature) can be used for carrying an extra load (optional waterproof bag). But some may opt for using the space for carrying 2 bikes and a kayak. The last one requires trailer with longer tongue (feature offered by Roadman Campers). Another recently available and very useful feature is the optional generator w/mounting hardware. Together with fuel tank it can offer much needed electrical energy when in the middle of nowhere. If needed you may also chose to carry the spare wheel (mounted under the tongue). BTW – you can also opt for bigger wheels (14” instead of standard 12”). It’s worth to mention that all these extras (tanks, cooler, spare tire, generator…) are attached to the trailer using custom hardware with no need for any hole(s). In other words the trailer’s structure does not need any modifications and is kept intact. Storage space (15 cu ft w/tent & pole bag and 19 cu. ft w/o tent & pole bag when used as the cargo trailer). Let's see this remarkable "baby"
Summarizing – the Roadman Camper seems to make a good choice for most bikers. Lightweight design with considerable cargo capacity, sleeping place for two with private dressing room, plenty of useful options and precious dual use….. It’s quite remarkable achievement !